Lamp available in suspension and ceiling versions. "Droplet is a ceiling light that appears as a pool of liquid aluminium reflecting two light pebbles. It has been generated totally by digital means and freezes in time the act of ripples that cross each other to define reflective zones and acting as a form of liquid dichroic." Materials: die-cast aluminium lighting units, die-cast aluminium reflector. Colours: satin aluminium and polished chrome. Light emission: indirect. Lamp available in the suspension and ceiling versions. 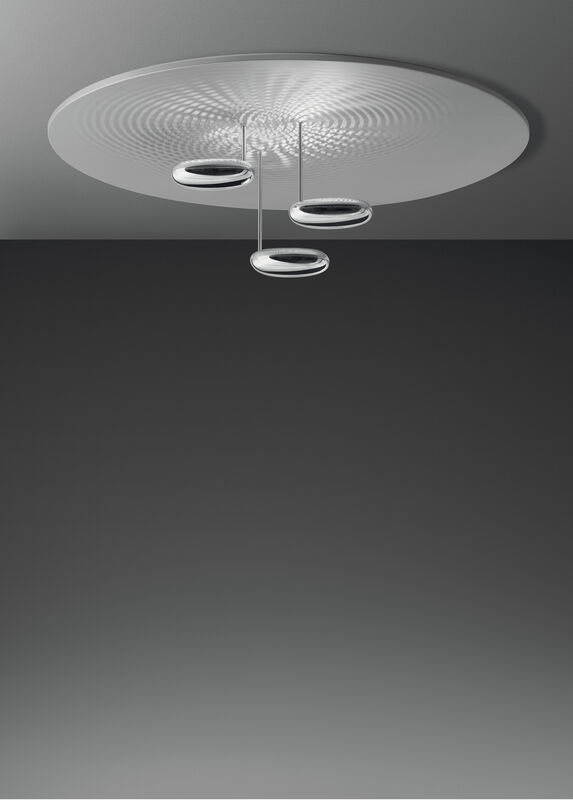 "Droplet is a ceiling light that appears as a pool of liquid aluminium reflecting two light pebbles. It has been generated totally by digital means and freezes in time the act of ripples that cross each other to define reflective zones and acting as a form of liquid dichroic." Materials: die-cast aluminium lighting units, die-cast aluminium reflector. Colours: satin aluminium and polished chrome. Light emission: indirect.